Lakeland was first occupied by the Western Yalanji people. 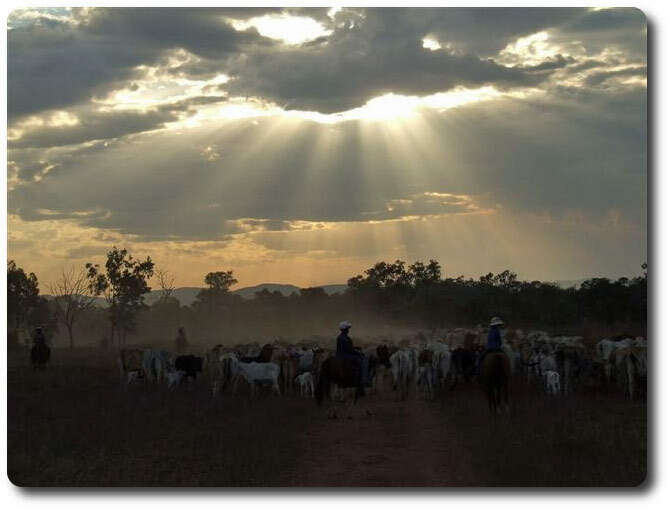 White settlement began with the Palmer River gold rush of 1873 and the establishment of a large cattle property known as Butchers Hill to supply meat to the goldfields. Lakeland was named after William Lakeland one of the earliest and most prolific prospectors of the Cape York Peninsula. He prospected with Christie Palmer on the Palmer River Goldfields in 1873, discovered gold in Coen in 1878, found gold on the Batavia river starting a gold rush there in 1892, and discovered wolfram in the Pascoe River and Iron Range. William Lakeland died tragically in 1920 after losing his way on a trip from Coen and running out of supplies at Mount Carter, Iron Range. His widow died at the age of 90 years and died in Cooktown. John Cyril Anderson, a self made transport millionaire from Toowoomba and owner of GWA bought Clive’s Lakeland holdings. Cyril diversified into peanuts alternated with maize and introduced a herd of 4000 red droughtmaster crosses to increase profitability. In 1979 David Hurse joined Cyril and they tried several different crops including sorghum, beans, tomatoes, cashews, watermelon and coffee. David fancied coffee as a profitable crop for Lakeland and planted Peruvian Arabica trees which produced the distinctive Lakeland coffee. Cyril died in 1983 but his wife and 3 sons and 3 daughters continued with his interests in Lakeland especially sons Bill and Tom. The GWA pastoral property was subdivided to allow 15 individual farms to be sold to the public. The first 9 were sold in 1986 allowing the population of Lakeland to grow from 80 to an expected 250. Today the Lakeland region boats a variety of crops including pawpaw, sunflower, teak, sandalwood, watermelon, African mahogany, passion fruit, pineapples, pongamia (a tree which produces a diesel substitute), seeds for fodder, and 2 large banana farms. Swiss Farms are also leaders in the production of compost for their own and others agricultural use thus reducing the need for fertilisers. There are also still several working cattle properties in the region. The Lakeland township is located 81 km south west of Cooktown at the junction of the Mulligan Highway and the Peninsula Development Road. 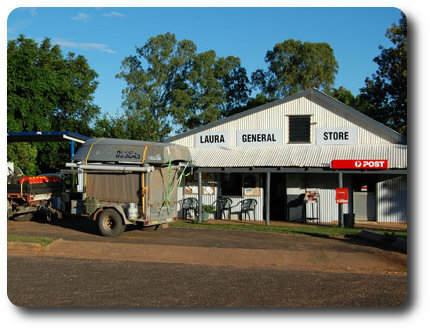 Although small it services this busy region and is a popular stopping place for travelers and locals going to Cape York. There is a roadhouse, coffee shop and store, hotel and caravan park that offers accommodation and safe van storage. Historic Laura, in Quinkan Country, was an important supply centre for the gold rush towns of Palmerville and Maytown in the 1870s, and once the terminus for the Cooktown- Laura Railway, the lifeline of early settlers in the north. Although the railway is now closed and the lines removed, if you follow the Laura Heritage Trail from the centre of town, you will get a feel for those early years. Relics from the era still remain, and you can visit the old Laura homestead and experience the confinement of an early police lock up. 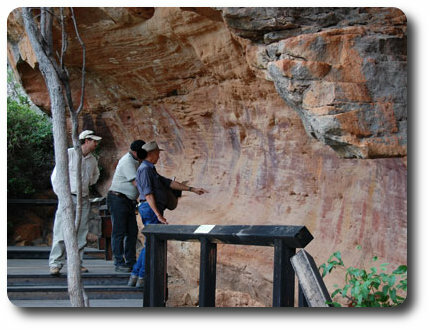 Today Laura is best known for its amazing Aboriginal rock art galleries, which were brought to world attention by local airline pilot and pioneer, Percy Tresize (1923-2005) in the 1960s. The Quinkan rock art galleries are now listed by UNESCO as being amongst the top 10 rock art sites in the world. A few of the sites are open to the public, including the Split Rock Galleries where you can take a self-guided tour. Call in at the Quinkan & Regional Cultural Centre for more information on the tours available, and spend some time looking at their fabulous displays. Laura is also well-known for two major social events, with its Annual Picnic Race Meeting and Rodeo in June drawing locals and visitors alike from around the region, and the spectacular biennial Laura Dance Festival drawing Aboriginal people from all over Northern Australia and visitors from all over the world. The next festival will be held in June 2017. This is one of Queensland's premier cultural events and not to be missed. Camping accommodation is available at the Ang Gnarra Community Campground near the Quinkan Centre and at the Quinkan Hotel next to Laura General Store. Access to Laura is either on the sealed road from Lakeland, or by 4WD following the scenic Battlecamp Road from Cooktown through the lower section of Lakefield National Park. There is also an all-weather airstrip located close to the town. The entrance to Lakefield National Park, Queensland's second largest national park, is just 27 km from the Laura township.